Aline Wickens is the owner and designer of The Pink Kitchen. 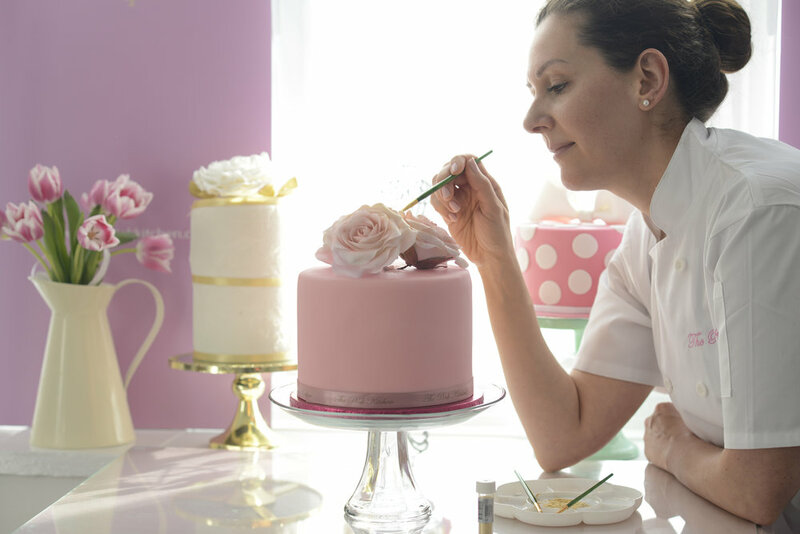 Aline works closely with each client to offer a personal touch, with high attention to detail in the creation of delicious and visually stunning cakes. The clients experience from start to finish is a highly regarded process that we love to provide for those special occasions. Aline has over 12 years of experience as a professional pastry chef in the UK. Specialising in wedding cakes, celebrations cakes, macaron towers, children’s birthday cakes and cupcakes, Aline is passionate about her own unique recipes and styling and providing something as unique as possible for her clientele. Aline was trained in French cuisine and graduated in the UK at the Colchester Institute - Pastry Cooks & Patisseries ABC level 3 and Food Preparation and Cooking Catering NVQ 2 level. Contemporary Tiered Wedding Cake at Fair Cake - London. Masterclass Chef Javier Guillen, Fine Dining Desserts - Spain and Chocolate Wedding Cake Course - Chocolate Academy Callebaut UK. Every cake is made with care, passion and love!